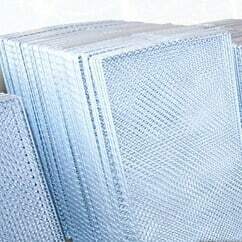 Filter cages are essential to ensure the optimum performance of your filter unit and prevent the collapse of your filter bags. These flat pocket filter cage inserts are compatible with most multipockets for Donaldson DCE UMA Unimaster Shaker Filters units. They can be purchased individually to replace single inserts, or in bulk to replace your unit’s entire filter insert set; there is no minimum order quantity. They are made from mild steel pre-galvanised wire with a knitted mesh. There are seven sizes available to order, to suit twenty-one different Donaldson DCE UMA Unimaster models. Orders can be delivered within 2-3 working days. Can’t find your model or need help choosing the correct insert size? Give us a call on 0845 519 8599. Different models require different sizes and numbers of inserts. The following guide will help you choose the correct filter insert and order quantity for your unit. Add edging strips to your order. These can be fitted around the edges of your filter cage inserts and will protect your multipocket filters from damage.